Many talented people are contributing to the creation of SHED, adding layers of ideas and artistry to the project. Scott Constable is a woodworker who uses his craft to explore the issues of everyday life, and chronicles his explorations in his blog deepcraft.org. 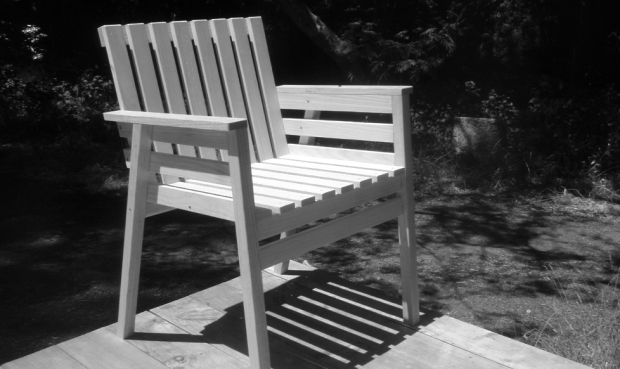 Scott has worked closely with us to design furnishings for SHED. As he writes here, Scott had a hand in more than just the furniture, and has helped shape our design direction from the beginning. Thank you Scott! Working with Cindy and designing these furnishings for Shed over the past few years have been among the most challenging and rewarding endeavors of my career. We share a deep philosophical alignment and I’m truly honored to have been part of bringing Shed into being. 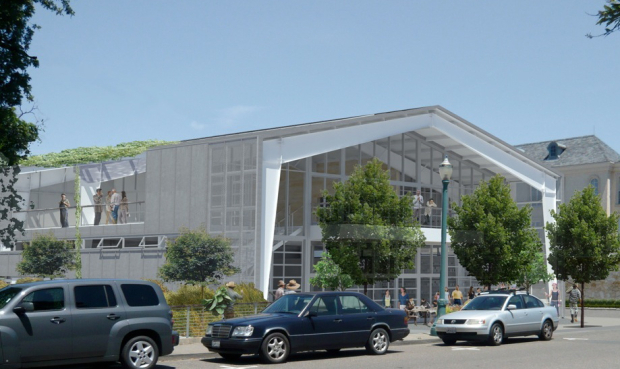 I’m confident Shed will become a vital mainstay of the community and a major destination in Sonoma County. Doug and I are putting a lot of time and love into the building. Our vision is becoming a reality with each flash of a weld and swing of a hammer. I visit every day, pink hard hat on head. The mechanical, plumbing and electrical work has advanced, and we are putting equipment in place. On the ground floor we installed our wood-burning oven and two cold storage walk-ins (one windowed for SHED’s prepared food). We designed the space for maximum flexibility. By sliding a barn door, we can open SHED’s kitchen for observation and classes. We have indoor/outdoor venues: sitting room, balcony, terrace, theater. We will tie events to the season and our region. Although we expect to occupy our building in December, events will begin a few months later in February. Standing in the center of the second floor on my daily visit, I look to the west over Foss Creek and see the historic Cerri Building, an old, metal fruit-packing shed. To the south I see today’s Healdsburg with its rose garden, green commons and the creek’s restored riparian habitat. This is exactly where we want SHED to be – at the confluence of the past and present, bringing tools, tastes and traditions to our community. To the West, over Foss Creek to the historic Cerri Building. Looking South to Healdsburg’s green commons and the creek’s restored riparian habitat. After months of careful site preparation, local workmen are skillfully assembling the bones on the building – clipping and bolting the rigid frame and roof supports. Following two years of planning and designing, SHED is taking shape on North Street. Until now, SHED has been a dream and an attractive architectural rendering. Now, we can vividly picture the front terrace, the coffee bar at the main entrance, café seating near the creek, and the pantry & larder (sources for eat-in and take-home food). With the beams in place, it is easy to imagine the second floor with the 1400 square foot gallery for meetings, classes, film, and performances. We have worked closely with the San Francisco-based firm, Jensen Architects, to design a building that thoughtfully addresses the constraints, as well as the opportunities, of our site. 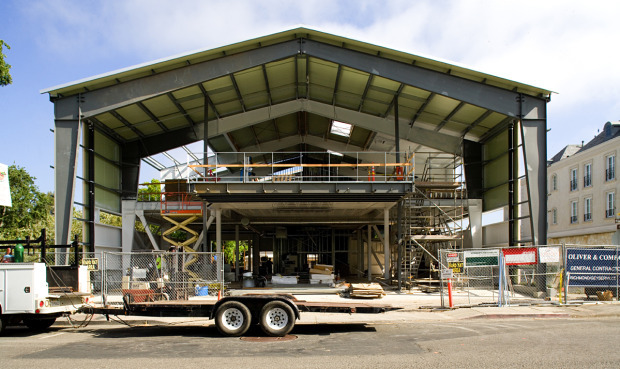 As a modern interpretation of the traditional barn or shed, our building references some of Healdsburg’s agricultural buildings, including the Cerri Building, the old prune packing shed across the creek. Sustainability is central to our design, which incorporates a resource-efficient, prefabricated metal structure, thermally-efficient insulated metal cladding, photovoltaic cells on the roof, and a naturally ventilated interior. Glazed garage doors on two levels open the interior to the outdoors, connecting to the street life in front, and to the restored creek-side riparian habitat along the building’s west facade. Our hands-on, full service construction company, Oliver & Co, is working with a crew of local sub-contractors. It has been amazing to watch SHED come together like a giant erector set, over the last few days. There are so many components critical to a successful project. We deeply value the close working relationships with Jensen Architects in the conceptualization of SHED, and with Oliver & Company in the construction process. Their experience, attention to detail, and quality workmanship are, well, how SHED happens. As SHED happens, see the progress on our SHEDcam.